David Risstrom and Rosa, the Greens' Melbourne City Council Policy Watchdog and Chairdog of the Senate Oversight Committee, keep a watching brief on news, ideas, issues and policies. If there are issues you think need to be discussed, please contact David at david@davidrisstrom.org. David last updated this site on 1 April 2006. LATE NIGHT TRAINS - MAKE THEM FREQUENT, CHEAP AND SAFE. The following two media releases were from the Victorian Greens. The Greens welcome news that some late night train services look like being extended, but fear cuts to other transport services may be the price to be paid. Bill Pemberton, Greens transport spokesperson and state election candidate for Eastern Metropolitan Region says " While one leak from Government is proposing some extended late night train services, it seems that other services - like express trains on the Dandenong line - are to be axed. This is not good news for Dandenong line travellers, who already have suffered at 12 per cent cut in peak hour services since privatisation." - synchs with the night rider service where it passes a train station. "Nightrider bus services must not be sacrificed as part of this plan. If the government is serious about making it work, Transport Minister Peter Batchelor will make sure the transport company staffs major stations until the last service and tram service providers extended their timetables to connect with the late trains," said Bill Pemberton. "This must happen quickly - so as not to lose the momentum and interest in public transport that was built during the Commonwealth Games." "Extended weekend services are a good, first step towards an effective, Melbourne wide, 24 hour public transport service for the 21st century. We can use Toronto as a model. It's a similar size to Melbourne but has trains running every five to six minutes to 2am. Meanwhile, we have bus services in the outer suburbs that finish as early as 6 or 7pm and don't run on weekends." said Bill. - Dandenong line: Before privatisation of Melbourne's rail service, the Dandenong line carried 16 services per hour during peak hours - there are now 14 per hour. - In 1929, there were 20 per cent more trains running through Flinders Street station than today. - The city loop congestion is not a capacity problem; it's a scheduling problem. The Greens select Jennifer Alden as Lead Candidate for Northern Victoria Region in the 2006 Victorian State Elections. Bendigo author, naturopath and women's health manager, Jennifer Alden has been selected as the Greens lead candidate for the Northern Victoria Upper House Region in the 2006 Victorian State Elections. "The changes to the voting system in the Upper House for this election offer voters who are disillusioned with the major parties an opportunity to vote a Greens' candidate into parliament," said Jennifer �people who care for sustainable land use, communities and a secure future for Northern Victoria can now have a new voice with fresh ideas to advocate for their community� she said. Jennifer Alden is the Executive Officer of Women�s Health Loddon Mallee and convenor of the Women�s Health Association of Victoria. Formerly a research microbiologist, then naturopath, she has a Masters degree in Women�s Health from the University of Melbourne and is author of the book �Liberated Eating. The Serotonin Programme for Depressed Dieters�. Active in local issues and community activities over many years Jennifer sits on the board of the Bendigo Uniting Care Outreach service and the Gorgeous Voices National Women�s Choir festival. She is a member of the Bendigo National Park Advisory group. �The Greens bring honesty, fairness and practical solutions for Victoria�s long term wellbeing� Jennifer said �I will work hard to be an effective voice for the Northern Victoria community�. - The Victorian state election will be held on the last Saturday in November (Nov 25th), 2006. - The Northern Region covers almost a third of Victoria. It extends from Gisborne and the Yarra Ranges in the south to the Murray River in the north, from Mildura in the northwest to the Towong Shire in the north east. - Changes to the Upper House boundaries and voting method will create an opportunity for more diverse representation in the next Victorian parliament. - At the November elections, five parliamentarians will be elected to each Upper House region via a proportional representation method of voting. This will replace the current single member electorates and preferential voting in the Upper House. For more information, please contact: Jennifer Alden mob: 0427430 233 or Dave Lane. mob: 0419 156 213. FOUR GREENS ELECTED TO TASMANIA - CONGRATULATIONS TO ALL INVOLVED!! The following media release is a welcome confirmation that despite the increasingly common dirty tricks campaigns of conservatives and their backers, the Tasmanian people have elected four Greens to represent them in their State Parliament. Australian Greens leader Bob Brown said the return of 4 Greens in Tasmania has set off jubilation among Greens supporters right across the country. "It's fantastic! There are 55,000 smiles on Tasmanian Green voters' faces tonight. And there is mud on quite a few other faces. The nastiness of the campaign will not be forgiven or forgotten and it will only make us stronger," Senator Brown said tonight. "I congratulate Peg Putt, Nick McKim, Tim Morris and Kim Booth. In particular, Kim Booth is our Greens' Lazarus tonight. And it is all the sweeter that he came back on Labor and Liberal preferences. "Tim Morris holding on to Lyons, where so much of Tasmania's magnificent forests are being trashed by Lennon-Labor, is another pointer to a more positive and hopeful future," Senator Brown said. I attended Murphy's Lake near Kerang for the opening of the 2006 Victorian Duck Shooting Season. With Victoria being the only Australian state to continue to allow the appalling 'sport' of duck shooting. Despite technical advice that the drought has meant a 2006 duck shooting season was not warranted, the State Government approved it nevertheless. I personally witnessed the shooting of an endangered speckled duck, with no action apparently being taken by the authorities. I also recovered more than 10 shot gun shells from the water, dropped by a shooter who refused to pick them up as required by law. Again, no action apparently taken despite this apparently being drawn to the attention of officers. Unfortunately for those of us who protested against this government endorsed disgrace, many of us were intercepted by Department of Sustainability and Environment officers and Victoria Police and had details taken for the issuing of fines. It was good to be among so many good hearted people who care for others, but being on the lake watching defenceless ducks being shot and often dieing slowly makes for a difficult but necessary job. I was able to recover one duck, left dead in the water by a shooter, that will help to provide evidence to the wider public that the duck shooting season is a historical anachronism that is long past its use by date. Below is a media release from my friend and Greens candidate Marcus Ward, detailing the Greens stand against duck shooting. The Greens are calling on Victorian Premier Steve Bracks to step in and cancel the 2006 Victorian Duck Shooting season which is due to open on Saturday (March 18, 2006). "The evidence is in," said Greens biodiversity spokesperson, and Western Victoria Upper House Region candidate, Marcus Ward. "When Australia's leading water bird expert says this year's duck shooting season should be banned, it is irresponsible for the state government to ignore this advice just to appease a shrivelling number of duck hunters." A survey by Dr Richard Kingsford from the University of NSW has found that there are about 200,000 water birds in eastern Australia and that: - the wetland area has receded to the second lowest ever recorded - the duck population increase has been dominated by two species that are off limits to shooters. "Duck numbers at this level resulted in a shooting ban in 2003. However, this year, the Victorian government has not only approved a full 12 week shooting season but has also increased the daily bag limit by 40 per cent," said Marcus. "Last year's limit was five ducks per day - this year it will be seven." "It seems that the state government has acted on the Department of Sustainability and Environment advice in declaring a season this year. Premier Bracks should be heeding the real expert instead and ban the shoot" said Marcus Ward. The Victorian Greens are committed to a permanent ban on recreational duck hunting. Background - Despite adopting a policy to end recreational duck hunting in Victoria back in June 1991, the Bracks government has refused so far to move on their policy. A factional deal done at the 2003 state ALP conference formally hog tied the party on the duck hunting issue. There is overwhelming public support to end duck hunting. According to and AC Neilson survey in March 2003, 70% of Victorians wanted a permanent end to recreational duck hunting. More Information: - Marcus Ward: ph. 5423 5254 / mob. 0427 235 254 or Dave Lane: 0419 156 213. FINALLY, PROOF THAT GLOBAL WARMING IS ALREADY TOUCHING US! With the International Panel on Climate Change set to release what are thought to be some fairly alarming predictions about climate change, I thought it time we publish some irrefutable proof that claimed change is already impacting on our lives. Forget the swapping of el Niño for La Niña, with this cartoon forwarded by Faye Adams of Manningham City Council, it looks like farmers are not the only ones getting a bum steer from our conservative political leaders. I have been following the Channel Deepening dispute ever since speaking out as a Green on Melbourne City Council. Below is a media release from Sue Pennicuik, Victorian Greens State election candidate. The Port Of Melbourne Corporation's announcement that a decision about channel deepening in Port Phillip will not be made before November's state election comes as no surprise. Sue Pennicuik, Greens Victoria spokesperson on channel deepening and candidate for the upper house Southern Metropolitan Region said �The original Environmental Effects Statement (EES) failed to comprehensively assess the effects of the channel deepening proposal on the short or the long-term health of the Bay. 'Fundamentally flawed' was how the independent review panel describes the EES." The Panel basically told the Port to go back to the drawing board and start again. Twelve million dollars of taxpayers� money was wasted to produce this inadequate EES. "The dodgy dredging trial of late last year not only wasted another thirty two million dollars, but most importantly, it caused significant damage to sea grass and kelp beds in the south of the Bay," said Ms Pennicuik. Neither the Port of Melbourne Corporation nor the Government have ever produced believable figures to justify their case for channel deepening. "Instead, they have relied on unsubstantiated and increasingly challenged assertions about the number of jobs tied to the Port of Melbourne and the supposed benefits to businesses or the Victorian community � described as �immeasurably minor� by the Port�s own spokesperson at the Panel hearings. No assessment of the impact on bayside small businesses and no serious economic analysis of alternatives to channel deepening have been presented to the public", said Ms Pennicuik. "Neither the state government nor the Port Of Melbourne Corporation can hide away their bay dredging plan until after the election. For tens of thousands of Victorians, this issue remains very much alive and is looking increasing hazardous. Greens in Parliament after November will work to ensure all the facts are made public and a genuine debate is held before any decision is made." "The Government and the Port should be thinking less about spending hundreds of millions of dollars on old-style mega-engineering projects and more about a long-term, nationally integrated freight and transport system," said Ms Pennicuik. "This includes the upgrading and better use of existing ports and rail in Victoria, as well as integrating interstate ports and railways. This would not only spare the Bay from unnecessary ecological damage, but would also reduce road trauma and congestion, reduce greenhouse emissions and improve air quality". Media enquiries: Sue Pennicuik mob: 0407000270. I wrote the following article on the success fo the Greens in the 2005 Victorian Local Government Elections. The 2005 Victorian local government elections were a great success for the Greens and the communities we now serve. Standing 31 endorsed candidates in 17 metropolitan, rural and regional councils, Victoria now has a 14 strong team of Green Councillors, two of whom are Green Mayors! We ran a strong, honest and open election campaign, with the conduct of our candidates providing further evidence that Victorian�s voting �1� for The Greens can have faith that the Greens will govern fairly on their behalf. Our five new Victorian Green Councillors are Cr. Samantha Dunn (Yarra Ranges), Cr. Miles Dymott (Brimbank), Cr. Helen Harris (Whitehorse) Cr. Ben Opie (Moonee Valley) and Cr. Philip Schier (Mount Alexander). Cr. Janet Rice, upon re-election to Maribyrnong, was voted by her Council to be their Green Mayor! Cr. David Jones of Greater Bendigo, elected in 2004, was chosen by his Council to be Mayor in only his second year in office! Our new Councillors are part of a fourteen strong team of councilors giving their communities much needed Green voices. Our newly elected Councillors join Cr. Fraser Brindley (Melbourne), Crs. Jo Connellan and Andrea Sharam (Moreland), Crs. Jenny Farrar, Kathleen Maltzhan and Gurm Sekhon (Yarra) and Cr. Julie Rivendell (Greater Bendigo). Facing insuperable preferences, sadly, we failed to re-elect Maribyrnong Cr. Colleen Hartland. All our Councillors deserve congratulations and support for the fantastic job they have and will do as elected Greens. Congratulations must also go to all the candidates who stood in this election. Putting yourself forward as a candidate is a powerful way of representing the Greens, and as many of us know, can be both a demanding and rewarding experience. Thank you also to all of you who gave credence to the motto �thinking globally and acting locally� by supporting candidates through your efforts, donations and goodwill. The 2008 local government election of all 79 Victorian Councils, the biggest election the Greens have faced to date, will be a great opportunity to Green Victoria. We have developed a solid knowledge and experience base of campaigners and competent candidates that have planted the seeds for a great deal more Green voices to grow. By thinking globally and acting locally, the Greens are growing from strength to strength. Thank you for being part of a good group of people who, through your decency and honesty, give our communities a real choice and a Greener future. Celebrating ten years in the Senate, Greens Senator Bob Brown was in Melbourne last night (Friday March 3rd, 2006) to speak to a sell out crowd of more than a hundred people at the Mosaic Restaurant in Box Hill. "The Greens are about the quality of life of future generations as well as the present," said Senator Brown. "However, the major parties are only focused on the short-term; they fail to look beyond the next election." With support for the Greens among the highest of any mainland state, the changes to the voting system in the upper house will give Victorians real choice at the state elections on November 25th. �Public transport in many eastern suburbs is a disgrace. In parliament, the Greens will work to introduce frequent, well connected and fast services in all areas," said Mr Pemberton. "Practical alternatives to private car use will produce less road congestion, lower business costs and improved urban air quality. This also means real action on climate change." "The Greens in parliament will also focus on health care. Mental health is a concern, and support services in Melbourne's east are totally inadequate. Great burdens are being placed on families and people with mental illness endure unnecessary suffering. The whole community is being adversely affected." In an alarming development that contradicts the stated intentions of the United States to reduce tension in the Middle East and East Asia, the announcement of a nuclear deal between India and the USA is a dangerous development that will further help to undermine the Nuclear Non-Proliferation Treaty. The following media release on this was issued by Greens Senator Bob Brown, encouraging the Australian Government to oppose this dangerous development through Australia's role in the Nuclear Suppliers Group. The Australian Greens today welcomed the Howard government's commitment not to sell uranium to India while it remains outside the nuclear Non-Proliferation Treaty but called on the Prime Minister to use Australia's position to block the US-India nuclear deal. "The proposed US sale of nuclear technology and fuel to India undermines the nuclear Non-Proliferation Treaty (NPT) and increases global insecurity," Greens energy spokesperson Senator Christine Milne said in Canberra. "Foreign Minister Alexander Downer's statement that Australia will not sell uranium to India while India remains outside the NPT is welcome. "Australia has the opportunity to apply this standard to the US-India deal through its role in the Nuclear Suppliers Group, which must vet the deal. "I am calling on Prime Minister John Howard to use Australia's position in the Nuclear Suppliers Group to demonstrate that he's not just US President George Bush's deputy sheriff but is capable of having an independent foreign policy. "Nuclear power is no solution to climate change. It is expensive, slow and poses unacceptable safety risks to people and the environment. "The NPT is not perfect but it is an important international agreement. By accepting that India will continue with its nuclear military activities while selling it nuclear technology and fuel for civilian use, the US is undermining the NPT and Australia must do all it can to prevent this." The Nuclear Suppliers Group was established in 1974 after the nuclear explosion in India. Its main purpose is to ensure that nuclear cooperation does not contribute to nuclear proliferation. Civil engineers and motoring organisations love their tunnels. As part of the long going fiasco the fix Melbourne's traffic problems by investing hundreds of millions of dollars in undermining public transport by increasing car volumes, the Eastern Freeway Westgate link tunnel again reared its tail. As an issue I fought while a Green on Melbourne City Council, I hope and doubt this issue will be buried for some time. Below is a media release from Greg Barber, Victorian Greens Northern Metropolitan Region State election candidate. Greens candidate for Northern Metropolitan, Greg Barber, has called on the Transport Minister Peter Batchelor to ditch the proposed cross-city tunnel, and expand Melbourne�s public transport system instead. Mr Barber said that the proposal was �irrelevant to the future needs of the city�. He called on the State Government to build the long-awaited Doncaster and Rowville train lines, extend other outer suburban lines and increase the frequency of public transport. Macquarie Bank presented the cross-city tunnel proposal at the VECCI Victoria Summit, which was opened by the Treasurer, John Brumby. The following email release was forwarded to me on 26 Feb 2006. A report prepared by international environmental organizations has ranked the Tasmanian logging industry alongside Third World countries such as Burma, the Philippines, Indonesia and Suriname. �The findings in this report directly repudiate the Government�s claims that Tasmanian logging is environmentally sustainable,� said Wilderness Society Campaigner Geoff Law, releasing the report in Australia today. 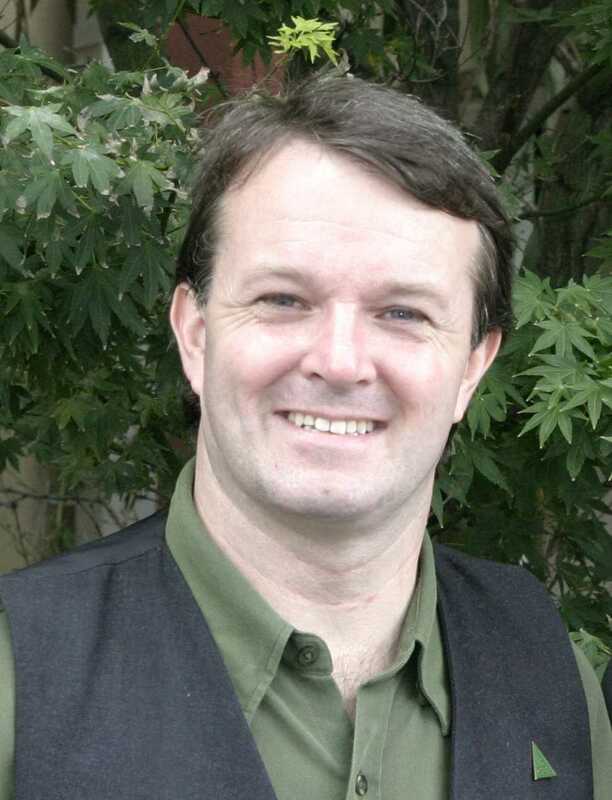 Cam Walker, from Friends of the Earth (Australia), said that the report blows the whistle on destructive practices such as the replacement of native forests with plantations, 1080 poisoning on private land, threats to endangered species such as the wedge-tailed eagle, and the creation of greenhouse gases by large-scale burning. The report was prepared by the IUCN (International Union for the Conservation of Nature), WWF, Greenpeace, Friends of the Earth (Netherlands) and other international groups for presentation to the European Union. It is entitled �Legal Forest Destruction� and explores the distinction between legality and sustainability. It presents a number of case studies around the world where destructive but legal logging occurs �in which the negative social and ecological effects are profound� (p.5). The logging industry in Tasmania appears alongside examples of destructive logging in Indonesia, Burma, Suriname, the Philippines, Russia and Cameroon. * Exemptions under which the logging industry operates which shield it from environmental laws, planning laws and freedom of information. The report takes note of the May 2005 Supplementary RFA but points out that the agreement �may in fact accelerate destruction as new roads are built into previously inaccessible areas.� It also points out that the agreement to phase out tree-clearing still leaves �about 70,000 ha more clearing, even if the decision is properly implemented�. The report points out that many of the areas �protected� by the Supplementary RFA were never threatened by logging in the first place, while forests that were subject to conservation campaigns, such as the Great Western Tiers, Blue Tier and Ben Lomond forests, are still being destroyed. If Gunns succeeds in either tying up the environment movement in court for years, or worse, in making out some of its major claims, it will have far-reaching ramifications for the environment and all those who campaign for it. While visiting stalls at the Sustainable Living Fair, I made a promise to a stall holder to put some information on my site about an upcoming meditation retreat. The forwarded information is detailed below. 'Stillness in Action' is the wisdom, calmness, courage and clarity that sustain a life of freedom and integrity in challenging times. Renew your spirit for restoring a sustainable environment, for building a just and equitable society, for participating in healthy and creative communities, for personal and social healing. Learn a simple meditation to still the confusions of the troubled mind - creating spaciousness in which wisdom and compassion arise, as your natural intelligence guides you towards new choices. · Use practical tools to clarify your values and intentions, and build the communities of friendship that will sustain them, and move them into action. · Nurture and refresh your body and mind through walking, yoga and silent contemplation of the beauty of nature. Your mornings will be spent in silent sitting and walking meditation, as well as contemplating and journaling in the bush. Creative group work, in the afternoon, is based on Joanna Macy's work in ecological and social spirituality. Joanna has created both a ground-breaking theoretical framework for a new paradigm of personal and social change, and a powerful workshop methodology for its application; Bobbi and Simon have added their own variations and innovations, crafting a superb retreat in which each day unfolds a new perspective. Evening sharing of stories, poetry, music and inspiring readings enliven and deepen community, drawing talent and creativity from participants. The retreat leaders bring a wealth of experience in meditation, creativity, social change and community – Bobbi Allan, Buddhist teacher and activist; Simon Clough, Buddhist practitioner, mediator and community builder. Both have trained with Joanna Macy. Our venue is in a beautiful location, with ready access to the bush. Accommodation is mainly dormitory style or camping. Delicious vegetarian food is served and special dietary needs can be catered for if advised in advance. Fixed Fee and 'Dana' Policy: Fixed fee is a sliding scale from $550 - $300. Pay the top rate if your income is $40,000+ - or lower price if income is $15,000-.Some part scholarships available on request. The fixed costs (which we keep minimal) cover the venue, accommodation, meals, advertising, materials and facilitators' travel expenses. The facilitators follow the age-old Buddhist tradition of 'dana' (generosity) in which the teachings are given freely and our work is supported by a voluntary, anonymous donation at the end of the retreat. In relying on participants’ generosity we are moving to an economy of gift. Testimonials from past participants: “Stillness in Action is exactly where the Social Change movement needs to go. The balance of personal enquiry, nurturing and remembering our interconnection with everything works for me.” David Naylor, community activist. "Stillness in Action is an extraordinary phenomena. It changes lives. It changes universes. If you are seeking a new way of seeing, of being, of awakening, then retreat with Bobbi, Ken and Simon. After 7 days, I feel truly blessed. I can appreciate all aspects of life with new clarity, deeper compassion, greater insight and directed intention." David, NSW Magistrate. “The five days gave me the skills to stop and reflect on the profound changes occurring in the world and within myself. This workshop sets the stage for a new roadmap to personal and group sustainability and sanity. Highly recommended!” Gilbert Rochecouste, Director, Village Well. “A delightful introduction to the community of ordinary people finding a way to blend healing of pain from the world of daily living with warm community.” Ian Niven. 14 February 2006: I wrote the following letter to the editor letter making connections between the gagging of public servants about the wheat for weapons scandal and the gagging of government scientists on climate change. It is available as a word download by clicking on he underlined title. Government Climate of Denial Sets Low Watermark - Letter to the Editor (24 Kb word document). The Prime Minister identified that his government�s silencing of our public servants in Senate estimates is not as novel as it should be. Measurable by another low watermark of parliamentary accountability during the ALP�s muzzling of debate on Coronation Hill, John Howard seemed to intimate �they did it too� makes obfuscation in this week�s Senate estimates OK. It doesn�t. 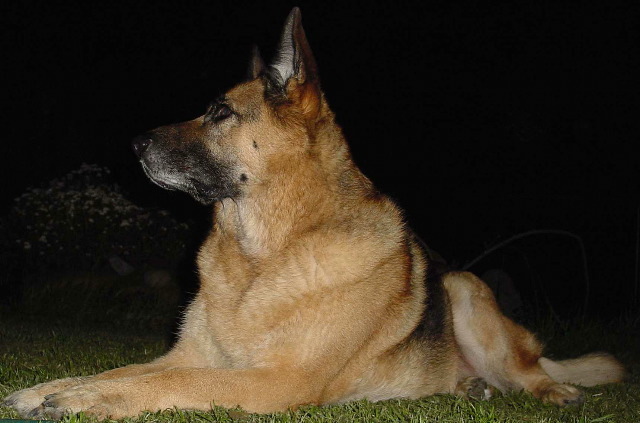 Most women and their dogs know the Cole Commission terms of reference limit investigation of the government�s role in this tragic tale. Gagging the Senate from inquiring into the Government�s possible role in breaking the United Nations sanctions is an offence to the trust we loan our Parliaments. Unfortunately, as damaging as the Iraqi wheat for oil scandal is likely for Australian farmers, it pales into insignificance when compared with our government�s obfuscation and inaction on climate change. Monday�s revelations that some of our best climate change scientists were gagged from letting the public know the likely extent and impact of climate change is yet another tragic breach of trust. Having studied climate change, I am all too aware how much damage Australia risks through storm damage, water shortages and severe drought. Australia�s farmers may well again pay the price for the government withholding the truth. Australian farmers have the right to know, as do all of us, why they have been misled. The Merri Creek has been important to both myself and my friend Rosa, its colourful contests meandering only a 100 metres or so past our Northcote home. On many a night, the quite burbling of the creek has provided a great break from the tumbling rapids of politics. Below is a media release from Greg Barber, Victorian Greens State election candidate, calling on the State Government to get their act together and do something. "The grassland ecosystems of the Merri Creek are the most endangered in Victoria. All important areas and species need to be protected first, before housing development speeds ahead," said Greg Barber, Greens Upper House candidate for Northern Metropolitan in the Victorian State elections. "As well as the important conservation areas, there needs to be a good open space buffer. The suburbs and the roads are being developed fast out that way, but the open space that future residents will need is being forgotten. "Every kid deserves a bit of a bushland park where they can explore and learn", Mr Barber said. * Latest Friends of Merri Creek newsletter "Broken Promise on Merri Creek Park"
- The Merri Creek Park was a commitment by the state government from 2001. Five years later we're still waiting to see it proclaimed. - Despite assurances from the Environment Minister's (Mr Thwaites) office that a draft plan would be released in December for public comment, there is still no sign of it. - The Victorian Government has argued that more time was required to negotiate the acquisition of private land. What's Required: - Protection of grasslands, swamps and creeks (including ancient - up to 600yr old - red gums around Edgars Ck) and key sites for endangered species such as the Growling Grass Frog and the Golden Sun Moth. On 16 January 43, asylum seekers from West Papua arrived in Australia fleeing persecution by the Indonesian military. They are now detained on Christmas Island. West Papua was invaded by Indonesia in 1962. As in East Timor, the West Papuans have been brutally repressed and their struggle for independence has been ignored by the Australian government. A Video Statement from asylum seeker leader Herman Wainggai filmed on Christmas Island. Question and Answer session and Discussion. I attended the long anticipated opening of the Clifton Hill Community Bank. It was a great event with music, food, grog, lots of people filling into part fo Queens Parade blocked off to traffic. The Clifton Hill Community Bank is part of the Bendigo Bank's community bank program, that provides a framework for a community to raise the capital guarantee for the establishment of a local branch. That work over the past few years came together yesterday in a great event. Congratulations to all involved in making a great community effort come to fruition! We're banking on a good future. I am at the Darebin Town Hall for a fantastic free workshop on how to compost and have a worm farm at your house. The food is great, the worms are happy and the company was good. About 30 people took the opportunity to hear local knowledge about what to do with your household scraps and while doing so, reduce their impact on the planet. can I suggest you encourage your local council to do the same and to get along to one if they already hold them. It was a good night out, and while as a composter and worm farmer for about 20 years, still learnt more about these fine skills. The following media release was forwarded through the Australia - East Timor Association, which I am a member of. The agreement for Timor Sea revenue sharing signed in Sydney today will deliver significant benefits to the people of Australia and Timor-Leste. The director of the Timor Sea Office, Mr. Manuel de Lemos, pointed out that the Australian Government stood to gain around US$2 billion in tax revenue from the Darwin LNG plant. In addition the Australian Government had already collected around US2.5 billion in tax revenue from the Buffalo, Laminaria and Corallina fields. �This is why our Prime Minister, Mari Alkatiri, has stressed the importance of fighting for onshore processing of gas in Timor-Leste. He said at today's press conference that a pipeline to Timor-Leste and an onshore LNG plant were technically feasible and economically viable,� Mr de Lemos said. �It is inappropriate to characterise the result of these negotiations as a 'very generous' gesture on the part of Australia. The resources at stake in these negotiations were claimed under international law,� Mr de Lemos concluded. Australian Greens Senator Christine Milne issued the following media release on the lamentable 'Asia-Pacific partnership', the Australian recipe designed to cover up the fact that Australia and the United States want to join the dinosaurs in securing a fossil fuel future for the planet, while they sustain their refusal to sign the Kyoto Protocol. After criticising the Kyoto Protocol for not going far enough the Australian government has failed to deliver any concrete measure to reduce greenhouse gases from the Asia-Pacific climate pact meeting, the Australian Greens said today. "Given that all of the proposed taskforces and the technology transfer being discussed could all be achieved under the Clean Development Mechanism of the Kyoto Protocol, why are Australia and the United States continuing to refuse to ratify the protocol?" Australian Greens climate change spokesperson Senator Christine Milne said in Sydney. "The answer is simply that they are not prepared to commit to binding emission reduction targets. "The first meeting of the Asia-Pacific climate pact has simply confirmed that the world's largest greenhouse emitters intend to dig in on coal, oil and gas despite the damage they are doing to the global environment. "Prime Minister John Howard has put a paltry $100 million on the table, offering just $25 million over five years for renewable energy projects while he backs old, polluting, fossil fuel energy sources. "Neither this funding commitment nor the taskforces will achieve the kinds of deep emission cuts even Environment Minister Ian Campbell has acknowledged are needed, in the order of 60 per cent by 2050, to avert the worst consequences of climate change. "Backing nuclear power as a long-term solution to climate change is short-sighted given its high costs, waste problems and the limited supply of uranium. "This week's decision by the Iranian government to recommence its uranium enrichment research should sound a warning. "Energy efficiency and renewable energy technologies are proven means of reducing greenhouse gas emissions, and it is gross hypocrisy for the Prime Minister to set up taskforces when he has refused to increase the Mandatory Renewable Energy Target or establish an energy efficiency target at home." Australian Greens Senator Christine Milne issued the following media release on the lamentable 'Asia-Pacific partnership', and the insipid moves to prop up nuclear energy while undermining efficiency and alternative energy efforts for which Australia was once well regarded. The Asia-Pacific climate pact meeting in Sydney is living up to the worst fears of environmentalists, namely that it is a sham to window-dress a meeting of resource deals, Australian Greens climate change spokesperson Senator Christine Milne said today. "News today that the United States is backing Australia in exporting uranium to China merely confirms the assertion that the climate pact is nothing more than the Asia-Pacific partnership for the export of coal and uranium to China and India," Senator Milne said in Sydney. US endorsement of Australia's uranium export push follows revelations that China asked last year whether it could evade export controls on Australian uranium if China owned some Australian uranium assets. The information is contained in answers to questions on notice asked by Senator Milne. "Australian officials told their Chinese counterparts that this was not possible but the fact that China was thinking along these lines raises serious questions about the nuclear safeguards agreement the two countries are negotiating," Senator Milne said. "If China is to limit its use of Australian uranium to civilian purposes then why would Chinese officials even consider how to evade Australia's export controls? "This information adds to my concerns that if Australian uranium were exported to China it could be diverted for weapons use or allow China to redirect uranium from other sources to weapons use. "Nuclear power, fuelled by Australian uranium, is no solution to climate change. It is dangerous, relies on hefty public subsidies and takes a long time to establish. "The Howard government should abandon its uranium export push and focus instead on proven renewable energy technologies and energy efficiency to address climate change." Senator Milne today attended a demonstration organised by community groups outside the Asia-Pacific climate pact meeting in Sydney. Australian Greens Senator Bob Milne Brown the following media release on the ALP's schizophrenic policies on climate change. Kim Beazley's Labor must overcome huge internal divisions if Labor is to adequately tackle the impact of climate change on Australia this century, Greens leader, Bob Brown said in Hobart today. (c) calls on the Government to incorporate a definition of environmental refugee into the 1951 Convention relating to the Status of Refugees. Senator Brown said the old parties were hamstrung by last century thinking, and by the powerful coal lobby. Senator Brown challenged Labor to emulate the Greens in establishing a specific portfolio for climate change and global warming. The Greens spokesperson is Senator Milne. With talk of the carbon cover-up 'Pacific Partnership' meeting being held in Australia in January, interest has turned up on the extent of our contribution to human induced climate change and what it may mean for our futures. Chris Mardon, former CSIRO scientist and Greens member has produced an interesting analysis that I have reproduced below with minor editing. From Chris Mardon: I recently sent out a brief analysis of global greenhouse data, but it occurred to me that some graphs might make the data look even clearer. I went back to my spreadsheet and plotted three graphs (shown below) that summarise the situation. I emphasise that this data is CO2 from the combustion of fossil fuels, gas flaring and cement production only, so it does not represent total greenhouse gas emissions. It also makes no allowances for land clearing and so forth as the UNFCCC figures do. However, it does give a clear picture of global CO2 emissions without all the usual flim-flam, and it includes emissions from the developing countries. The global total is now 25,000 MT pa, of which Australia contributes about 500 MT. 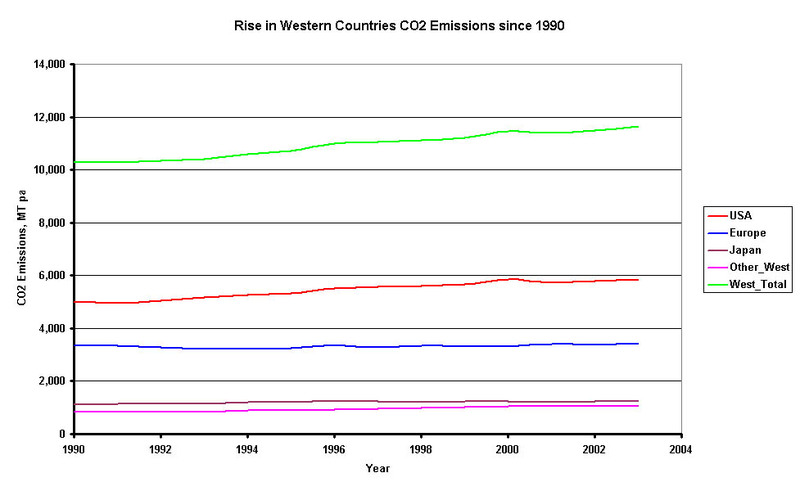 The first Graph 1(Global Carbon Dioxide) shows that while the total CO2 emissions from Western countries has risen somewhat since 1990, that rise has been more than compensated by the fall in emissions from the Eastern Bloc countries. However, there has been a dramatic rise in emissions from developing countries, such that their emissions now almost match that of the Western countries. This rise has been particularly rapid since 2000 or so. The Eastern Bloc emissions actually bottomed out in 2002, and are now starting to rise again as their economies begin to recover. The global total has been rising continuously since 1991, and the effect of the rise in emissions from developing countries in recent years can be clearly seen. 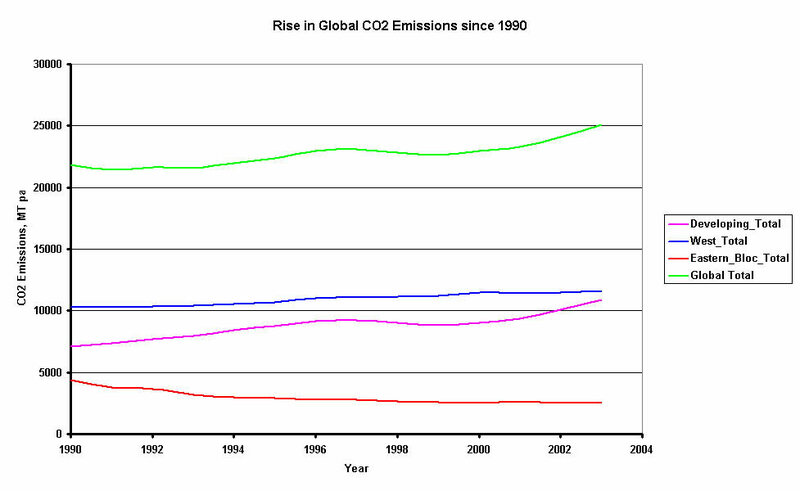 Those emissions are not only getting very big, but they are rising rapidly as well. The second graph (Dev_CO2) shows that the bulk of the emissions from the 150 or so developing countries come from just nine countries. Of those nine, the emissions from China and India really stand out. The emissions from China alone exceed those of the rest of the developing countries combined, and the curvature of the Chinese emissions is reflected strongly in the total emissions from the top nine countries. The dip in Chinese emissions between 1996 and 2000 resulted from the abolition of state subsidies on the price of coal which accounts for the bulk of their emissions. Sustained rapid economic growth has caused emissions to start rising again. 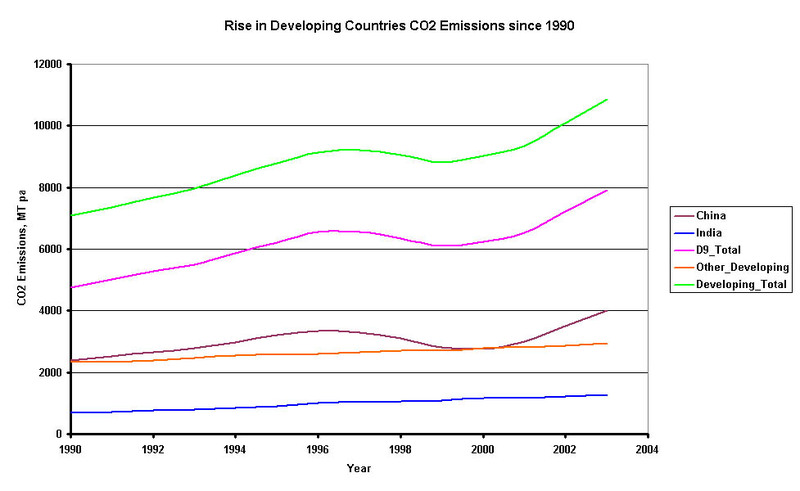 There is clearly a rise in emissions across the board and emissions from China and India dominate the rest. The other members of the top nine countries (in descending order) are South Korea, Saudi Arabia, Mexico, Iran, Indonesia, South Africa and Brazil. While these nine countries should all be making an effort to restrain the growth in emissions, there must absolutely be something done to reign in emissions from China and India if global emissions are to be stabilised, let alone reduced. However, since they are poorer than western countries, they should be helped by the western countries to reduce their emissions. The Clean Development Mechanism (CDM) already exists for this purpose, but it is not enough. The USA and Australia have proposed the extension of the CDM to cover “clean coal”, geosequestration and nuclear power, but green NGOs adamantly oppose this. Since the emissions from China and India are predominantly from coal, I think that some transitional mechanism that includes “clean coal” is inevitable if their emissions are to be reduced without impeding their economic development. I can hear all the greenies shouting “shame”, but frankly, building wind farms and solar PV will just not cut it. China is building new coal power stations every week or so in an effort to keep up with demand. While they commit to using electricity more efficiently in future, they should be increasing generation efficiencies now by using coal gasification/combined cycle systems. If all their new power stations were efficient, and their older stations were gradually replaced with efficient new power stations, then their emissions could be stabilised and perhaps even reduced over the next 20 years or so. They just cannot afford to build such large amounts of renewable energy now at their present stage of development, and they don’t have enough gas to generate more than a small percentage of their power requirements. They should be given time to make the transition to renewable energy, but they need to improve the generation efficiency of their coal power stations right now if their emissions are not to go through the roof and offset reductions in the rest of the world. China will eventually have to be weaned off coal, but I don’t think that they can do it now. The third graph (West_CO2) shows that while Europe and Japan have been able to keep their emissions approximately constant over the last 15 years, the USA and other western countries outside Europe (including Australia) have not. Hence the Western total shows a steady increase, and were it not for the fall in emissions from Eastern Bloc countries that I referred to above, total emissions from the developed countries would have risen rather than falling as they have appeared to do. Europe and Japan have been rather smug about their efforts in restraining the growth of their emissions, but the lack of action by the USA, Australia and the developing countries has nullified the effect of their efforts on global emissions. Unless we all pull together in future, and help both the Eastern Bloc countries and the Developing countries to reduce their emissions, then global emissions will continue to rise and irreversible climate change would appear to be inevitable. It is really time to stop the finger pointing and get on with realistic strategies to make deep cuts in global CO2 emissions as quickly as possible. It will not be pretty, but the alternative is worse. My propensity to open my muzzle more often than banks close their branches has meant Rosa's Rave has had to move to new pages each three months. This page provides my news and views from January 1 to March 31 2005. The previous edition of current news and views are available by clicking here: Rosa's and Dave's News and Views: Oct-Dec 2005.